Add simple, vintage-style fuzz to your signal chain. 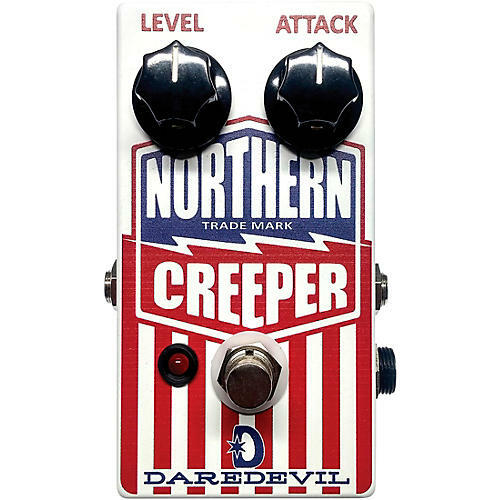 The Northern Creeper Fuzz from Daredevil Pedals features a circuit is thick and biting, reminiscent of early '70s fuzzes by Shin-ei or Maestro minus the extra controls. It features just volume and sustain. It gives you more output, even tone response and more gain. It sounds big, gritty, blown out and saturated—but tight enough to hold its own in a live setting. The Creeper has a raspy, crunchy edge and loads of sustain with a little bit of low-end sag. You can even get a more starved feel using the ‘ol dying-battery approach. It really opens up and adds a bit of harmonics with a cranked tube amp.